The SWEETTANK® concept has been developed to stop odors in yacht and RV holding tanks without the use of chemicals or filters. SWEETTANK® is standard equipment on THERMOPURE-2® Type-I MSD, in GROCO Type-III MSD, and is offered in several retrofit kits to fit existing holding tanks. Aerobic and anaerobic bacteria coexist naturally in raw sewage, but it is the anaerobic bacteria that produce undesirable odors. By inducing a constant flow of air into the holding tank through a submerged aeration tube, SWEETTANK® produces an oxygen-rich environment in which the anaerobic bacteria cannot thrive, thus eliminating unpleasant odors. The heart of the SWEETTANK® system is a compact module that operates continuously to deliver air to the holding tank using less than 3-watts of DC power. For yachts where AC power is always available, an AC powered SWEETTANK® module is offered. SWEETTANK® screws into a 1-1/2" NPT threaded fitting in the top or side of the tank. If the tank has no 1-1/2" NPT opening, aeration equipment is installed into a 2-1/2" hole cut in the tank top or side. All mounting hardware is included. STK-18 fits tanks up to 18" deep. Contact GROCO for installation in tanks deeper than 18". 1. 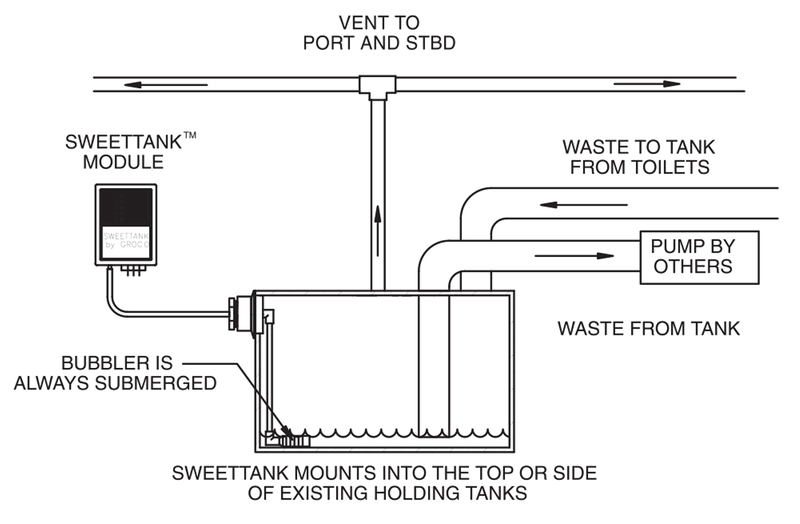 Install SWEETTANK® into the top or the side of any rigid holding tank. STK-18 fits tanks up to 18" deep. Models are available for deeper tanks (call GROCO MSD Technical Service). 2. Install a complete ZDS Series Type-III MSD. 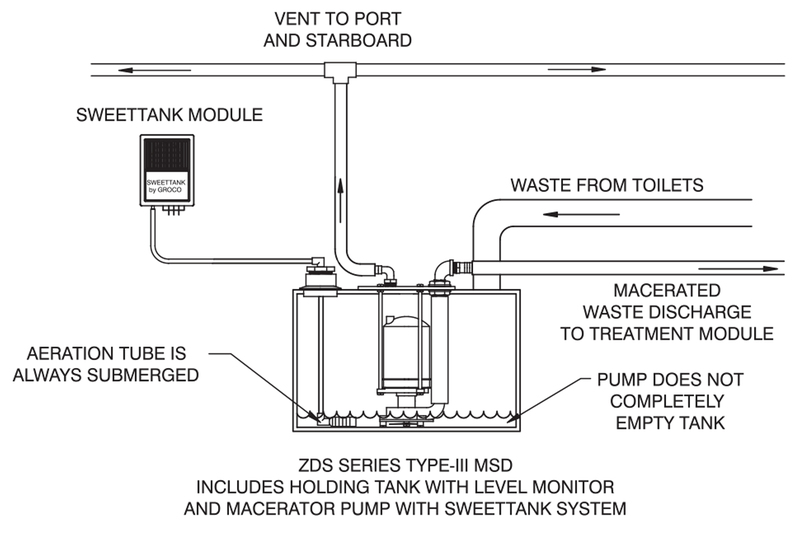 ZDS includes the holding tank, level monitor, macerator/discharge pump and SWEETTANK®.